When I wrote for California Voice, The Original Sentinel Newspaper, City Magazine and the Sun Reporter, I kept the items in the short Three Dot Journalism style. Many of you have written that you miss the old Three Dots and a Dash. It’s a fast read. And hey … it worked for Herb Caen … So for old memories … its back. 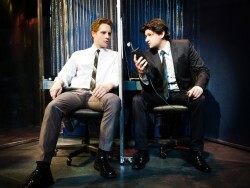 WIREHEAD AT THE SF PLAYHOUSE is a knockout that pulsates with the thrill of discovery. Audacious and top drawer actors Scott Coopwood … Craig Marker … Gabriel Marin … Madeline H.D. Brown … Lauren Grace … and Cole Alexander Smith find new ways to make your hair stand on end and … sizzle your brain at the same time. Yep … it’s a brave new world. The .98-minute play by Benjamin/Brown is brilliant. The time: Soon … The Place: America. The effect: Scary! You see … their brains have been wired to keep up the corporate workload. They don’t even need phones … the workers just twist a finger in their ear to turn the phone on or off. So much better than carrying a cell phone. Susi Damilano is A Tour De Force of Masterful Directing … A Groundbreaking JOLT of Genius. I might even say “Superb” … oh I just did. Keep you eye on the men’s shoes in this play. They all wear oversized shoes. And … you know what that implies … don’t you? Dot … Dot … Dot. Oh yes — Bill English has designed another amazing set. Now playing at the San Francisco Playhouse … on Sutter Street near Powell. OVER AT THE CUTTING BALL THEATRE … the everyday becomes extraordinary. Storytelling is their specialty … and Playwright Will Eno seems to be the Patron Saint. Out of the three acts — “The intermission” (that’s the name of the play) … is the best of the three. We in our seats are looking at an audience who is looking at us … like we ARE the play. Yes, they are sitting in theatre seats. The play has just ended – and during the intermission they talk about the play to each other. Oddly enough … the players have better chairs than we did. They actually have armrests. The talk from the four in the audience sitting on the stage — goes from being pompous … to pretension. It’s a parody of course. But … you do get the feeling that they are somehow mocking us. Very interesting also is “Mr. Theatre” … he’s a man that rants and raves in a frightening way. Is Mr. Theatre … joking or is he on the edge of insanity? I would say both! My least favorite of the three would be … ”Lady Grey”. Well it might be a good monologue … but … she mumbles so under her breath, that you can’t catch most of the lines. I think what is lost here is the lack of impact. It’s an intimate space … but the actress hardly spoke loudly enough for anyone to really get it. The plot of Lady Grey is about Lost Love … and they might add — lost words. The play is cleverly assembled by Rob Melrose. The splendid actors are … David Sinaiko, Gwyneth Richards, Galen Murphy-Hoffman and Danielle O’Hare. At The Cutting Ball Theatre … (Exit – on Taylor). Louise Pitre (Star of Mama Mia) sings at Rrazz Room. Courtesy Photo. GOING TO THE RRAZZ ROOM IS LIKE GOING ON AN AMAZING CRUISE SHIP RIDE … and I have rarely been disappointed. The talent at the Rrazz … NEVER fails to get an enthusiastic audience. Just the other day … I went to hear Louise Pitre … who has appeared in Les Miz, Mama Mia and several other Broadway shows. Pitre spent a lot of time on the Orpheum stage in Mama Mia – and to hear her sing at the Rrazz fantastic treat. Her big and brash … “The Winner Takes it All” from Mama Mia was just dazzling. Pitre sings a lot of Piaf songs … some in French and some in English. She frequently says the words of the French songs in English so that we — who don’t know French language … know what the story is about. After All … all songs are short stories. Pitre has tremendous heart, especially with songs like the stirring “Non, Je Ne Regrette Rien”. You won’t easily conquer her. She keeps a good balance of music … especially with the amusing “One Hundred Ways to Leave a Man.” Not sure that is really the title – but that’s the story of the song. “I Love songs about despair and breaking up” … she says. Pitre also said: “I hope before I’m too old to sing “Some People” on the stage in the musical “Gypsy”. Here’s Buzzins’ take: “She would be perfect!” Looking forward to seeing her again at the Rrazz Room … she’s one of the best this year! Super P.R person Lisa Bautista sez that she has something for everyone @ therrazzroom this May 2011. Look for The Mills Brothers on 5/1 … Amanda King on 5/2,9,16 … Betty Buckley on 5/3-8. It’s gonna be a hot time at the Rrazz in May. Liz Taylor. I interviewed her in the 80’s at the Sir Francis Drake Hotel. Took many pictures of her – which I have now lost. She said to me “You’re so cute.” Remember … this was in the 80’s – I might have been cute then. Las Vegas superstar Celine Dion … packing them in again in her tribute to Michael Jackson. Still looking in the height of fashion. Didn’t know. Some people were shocked and outraged by Victoria Jackson’s recent tirade against the TV show “Glee”. Some say that she has been clawing her way onto the TV here and there. What do you think? Dash, Dash Dash.